11:30 to 12:00 – Meet & Greet, and grab a snack. Overview: There’s been a lot of talk about Apps in the new SharePoint 2013, and a lot of people are still confused about what they are, how they can benefit end users, and why you’d even need them. This presentation will help you understand their value (for both the end-user and the business), how they work in your environment (on premise or in the cloud – Office 365), and will give you a first-hand look at a handful of apps, and how we use them in house (at itgroove) to benefit our own processes. This presentation is meant for business users to understand what Apps mean to them (sorry developers, we’ve already done a dev session on apps). This month’s prize will be another brand new, unlocked Nokia Lumia 800 Windows Phone. Eight spots have already been reserved – Reserve your spot today. To understand the reasoning behind the new changes you can read vSharePoint host Sean Wallbridge explanation on the vSharePoint Meetup page. If you have any concerns with the changes, you can send your comments to Sean for review. This month vSharePoint will be playing a game of heads or tails to see who goes home with a new, unlocked Nokia Lumia 800 Windows Phone. Eight people have already reserved their seats – including Sector Learning Solutions’ Manny Mandrusiak. Reserve your spot today. Eighteen members attended this meetup and including Sector Learning Solutions’ new Collaboration Systems Business Analyst, Rebeca Saenz. Thank you to Rebeca for taking notes on the presentations to create this summary! 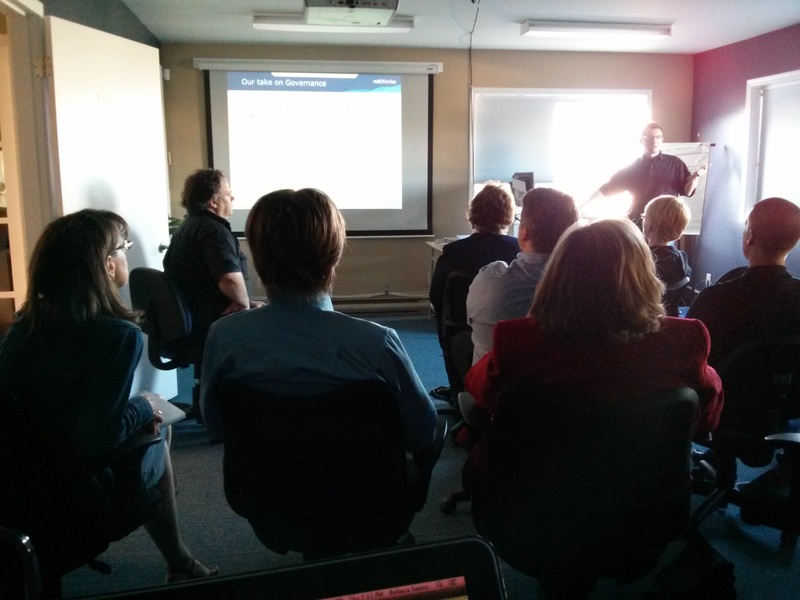 Rob Morrison’s BC Ferries SharePoint Implementation presentation offered insight into “the good, the bad, and the ugly” of their SharePoint implementation – placing emphasis on what worked for them and what they would do differently in the future. After illustrating the key pain points that BC Ferries faced – including a lengthy and complicated document change request approval process in conjunction with 12,000 paper documents stored in a 26 foot wall of cumbersome binders that resulted in bottlenecks and difficulty finding information – he highlighted the ways that SharePoint optimized processes, created a culture of communication, and reduced use of paper. 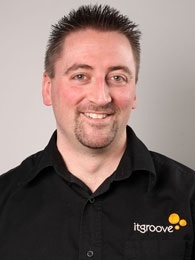 Rob shared a brilliant tip for others seeking a smooth transition – the creation of a “Ten Commandments” document – containing a list of rules for staff to follow – including best practices such as using standard SharePoint templates for root pages and assigning a “leader” to maintain each SharePoint site. Sean Wallbridge’s The Book of 5’s presentation took a fun, interactive, approach – and solidified his preferred title of “SharePoint Jedi” by emphasizing the fact that although there are SharePoint MVPs (of which he is one), there are no experts, just those who continue to explore the ever evolving ways of the SharePoint force. Sean shared a series of top five lists he has compiled on all things SharePoint then asked the audience to share their recommendations of what they would include on said lists. The list of Top Five Websites to Follow for SharePoint-related Content included SharePointReviews.com, Slideshare.net, and Twitter (#SharePoint) – and was bolstered by the following audience contributions – reddit.com/sharepoint, sharepoint-videos.com and xkcd.com (because who doesn’t love witty comics!). To access the PowerPoint slides from this and past vSharePoint meetup presentations delivered by Sean and other itgroove staff – check out their SlideShare account – http://www.slideshare.net/itgrooveservices. The June vSharePoint meetup is scheduled for: Thursday, June 13, 2013. I have some insider information – vSharePoint organizer and event host, Sean Wallbridge, is planning on mixing things up – with a NEW location and NEW meetup time. Want to be ‘in the know’? Make sure you’re a member of the vSharePoint Meetup group to receive email announcements of any changes – as well as the speakers and topics for June. Fourteen members attended this meetup and were rewarded by a (accidental)double order of pizza – Hot House Pizza trumped Dominos as the clear favourite. Keith Tuomi’s Document Sets 101 presentation included a live demo in the Office 365 test site – an excellent resource for those wanting a fully populated test site to show off the new features in 2013 to colleagues. For those who don’t know, Document Sets allow site administrators to create a “glorified folder on steroids” used to group documents and files that are stored within one library together so that they share metadata and have a common homepage, workflows, and archival process. Fortunately, if your library contains files for multiple projects, you can set up multiple document set types in the library. So why does this matter? Document Sets free you from having to use folders to organize data when a hierarchical structure is not required. When data is nested in folders you have to apply metadatas and workflows to each folder one at a time. Document Sets allow you to apply these in one place reducing inefficiency and saving you time. Chris Stone’s Back to Basics: Permissions presentation highlighted his ability to transform a topic that is often migraine-inducing for new SharePoint site administrators into a clear, easy-to-absorb concept. 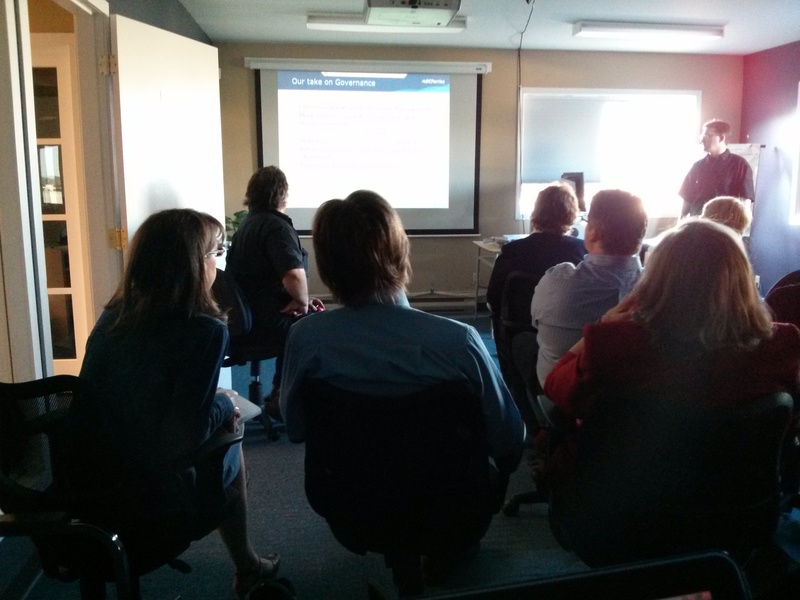 Join the Victoria SharePoint Users Group to access copies of both presenter’s PowerPoint slides. 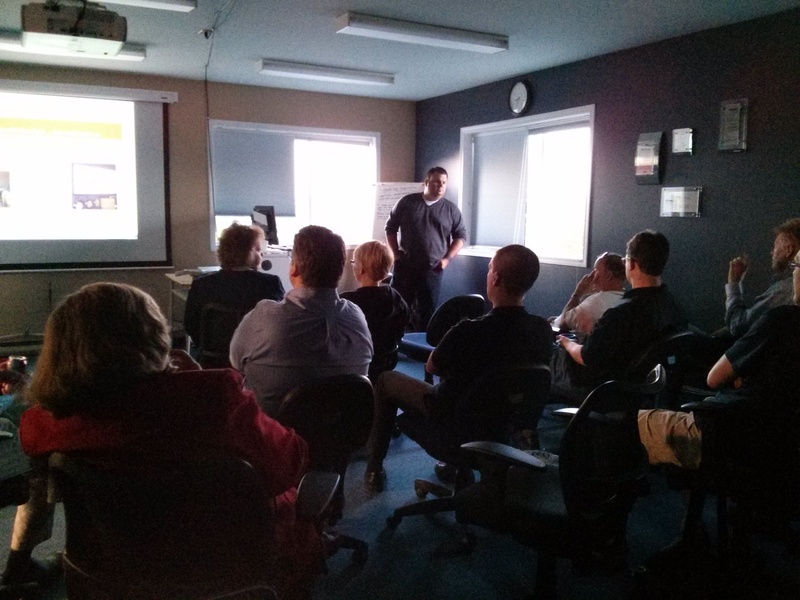 The May vSharePoint meetup is scheduled for: Thursday, May 9, 2013 from 6:30 PM to 9:00 PM at Sector Learning Solutions’ training centre. Presenters and topics for May meetup will be announced in early May. 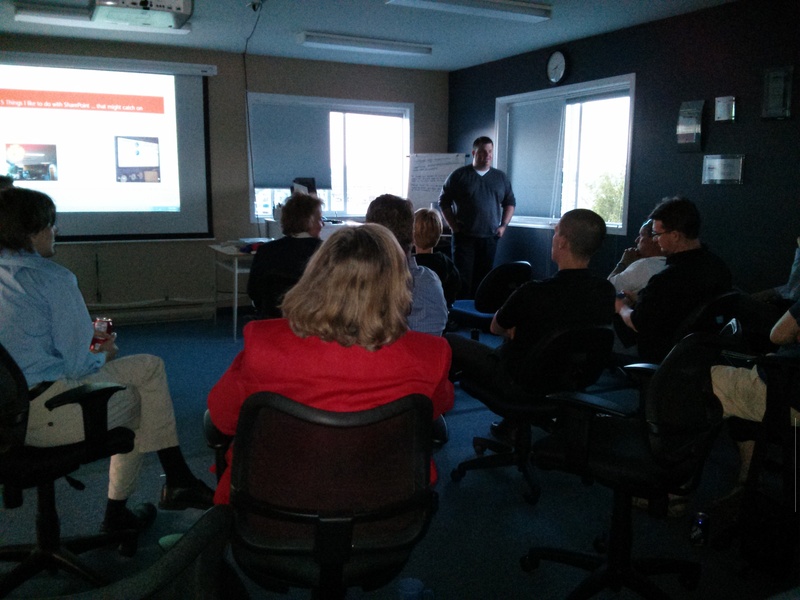 Victoria SharePoint Users Group – Mark the Date – November 22nd, 2012! 951 Alston Street, Victoria, BC. or login to register for the November vSharePoint meetup. Click here to learn which topics that will be covered at the November meetup.